Looking for the UK’s top caravan transport? SG Haulage understands that our customers have many and varied needs. Over the 25 years since we started this family firm, we have moved almost every type of unusual, abnormal, or heavy load. One area where we have seen a lot of business is in the haulage of caravans. Whether mobile caravans, static caravans, cabins, or even motorhomes, we have helped hundreds of customers transport their cargo within the United Kingdom and Europe. This is what makes us the number one choice for caravan transport in Lincoln, Nottingham, Grantham, and nearby areas. Our fleet of 23 vehicles are ideal for transporting your caravan or cabin to any destination across the UK. We also have extensive experience of deliveries to Europe, especially to Holland, France, Belgium, Germany, and Spain. SG haulage provide high training to all our staff, and we hold all the accreditations required so you can choose us with confidence. Where your load is abnormal in any way, we always liaise with the appropriate agencies and authorities to ensure a smooth delivery. Why not call us today to discuss your caravan transport needs? Boats come in all shapes and sizes, from sleek speedboats to large ocean going yachts. In the 25 years we have been operating, we have moved them all. Boats can be perhaps one of the most delicate cargoes to transport, so our team always work with the highest levels of care, diligence, patience, and attention to detail, to ensure that your boat transport from Lincoln, Nottingham, or Grantham, is completed successfully, whether the destination is in the UK or in Europe. We have all sizes of transporter to haul your boat wherever it needs to go, and we take care of every aspect of the move, from dock to dock, so that your boat is waiting for you in the water at your destination, letting you travel worry free. If you need mobile home, cabin, or caravan transport, SG Haulage will see it safely to its new home. We can also move smaller pieces including sheds, building materials, stage equipment, and even hot tubs. With a large fleet, our cabin and caravan transport services are available to both domestic and commercial clients. With over 25 years of experience, we’ve moved all sorts of vessels, from speed and sailing boats through to large yachts and luxury liners. Boat transport is a delicate operation so we work with the greatest care, patience, and diligence to transport your boat safely and professionally. From dock to dock, you can rely on us for all your unique requirements. 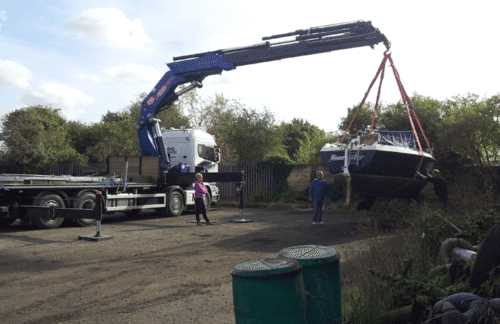 Whatever your size of boat, wherever you need it moved to, call us today and ask for a free no obligation quote on 01522 702 443.